*We do not schedule monthly General Membership Meetings for the summer months of July and August. Therefore, tenants and friends will have to rely on our mailings for information. At our Annual Meeting, we will be electing three (3) members to our Board of Directors. MVUT has a nine (9) member Board and three (3) seats come up for election every year. All paid members of MVUT are eligible to vote. If you are interested in serving on our Board, give Dennis Hanratty, the Executive Director, a call. And begin making plans for the upcoming year’s campaigns. Come to the Annual Meeting! Get involved in one (1) or more of the important issues/campaigns listed above! Help us win more victories and become even stronger! Help us raise funds to improve even more!! Please call 699-1114, ext. 303 for more information. Thank you for your continuing support for Mount Vernon United Tenants. 2011 was a really tough year for us financially. We’ve run a deficit all year long, as the County Executive took our critically needed eviction-prevention funding out of the County budget. We need support from friends and members like you, as much as ever. — We were the lone non-NYC organizaiton in the Real Rent Reform (R3) campaign that got our state rent laws renewed and strengthened. This is the first time in nearly twenty (20) years when the laws weren’t weakened! — Stopped over 150 evictions! — Successfully rehoused over twenty (20+) individuals/families! — Helped organize eighteen (18) building tenant associations! — Secured free, quality used furniture for over sixty (60) families! — As a lead organizer in the Hudson Valley Coalition for a Fair Economy. — Fighting for restoration of funds in the Neighborhood Preservation Program (MVUT’s largest funding source). — Participating with the R3 Campaign to strengthen the State’s Rent Laws. — Working with the Westchester Non-Profit Housing Coalition to ensure Westchester County’s compliance with the historic “Settlement” for 750 “Fair and Affordable” units. 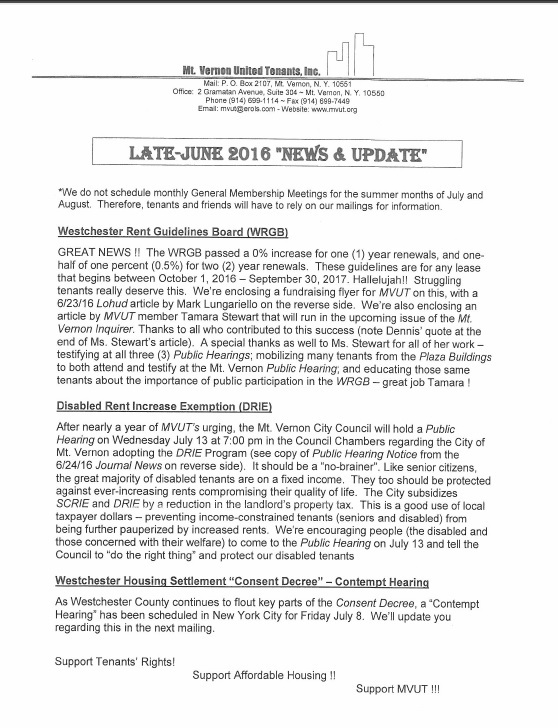 — Preparing for the upcoming (late Spring) Westchester Rent Guidelines Board Hearings. We’re working non-stop to keep tenants’ hosuing safe, dignified and affordable!! You have helped us to carry on this work. Thank you!! To do even more, we ask that you consider continuing to support us with a generous financial contribution. Please encourage your neighbors to support us as well. Click here for a PDF version of this letter.